How to Cite This Chapter: Van Spall HGC, Rahman T, Bednarz B, Budaj A, Goncerz G. Acute Heart Failure. McMaster Textbook of Internal Medicine. Kraków: Medycyna Praktyczna. https://empendium.com/mcmtextbook/chapter/B31.II.2.19.2 Accessed April 20, 2019. Acute heart failure (AHF) may develop de novo, that is, in a person without prior documented heart dysfunction, or as acute decompensation of prior heart failure (HF). Causes of AHF: Acute coronary syndrome (ACS), mechanical complications of myocardial infarction (MI), acute valvular regurgitation, markedly elevated blood pressure (BP), arrhythmia or conduction disturbances, peripartum cardiomyopathy, cardiac surgical complications, infections (including myocarditis and infective endocarditis), endocrinopathy, high cardiac output states (severe infection [particularly sepsis], thyroid storm, anemia, arteriovenous fistula, Paget disease), nonadherence to medications. Ischemic heart disease and long-standing poorly-controlled hypertension are the most common causes of AHF, especially in the elderly. Predominant etiologies in young patients include dilated cardiomyopathy, arrhythmia, congenital heart disease, valvular heart disease, and myocarditis. 1) Features of low cardiac output (hypoperfusion) if cardiogenic shock is present: Fatigue; weakness; confusion; drowsiness; pale, cool, and moist extremities, occasionally with peripheral cyanosis; thready pulse; hypotension; oliguria. a) In systemic circulation (right ventricular failure): Peripheral edema (ankle or sacral pitting edema; this may be absent in early AHF); jugular vein distention; epigastric tenderness (caused by liver enlargement); sometimes ascites and pleural and/or pericardial effusions. b) In pulmonary circulation (left ventricular [LV] failure, which may lead to pulmonary edema): Dyspnea, tachypnea and orthopnea, crackles over lungs. 3) Features of the underlying condition causing AHF. Based on the features of peripheral hypoperfusion, the patient may be classified as “cold” (with hypoperfusion) or “warm” (without hypoperfusion), and based on the features of pulmonary congestion, as “wet” (with congestion) or “dry” (without congestion). Diagnosis is made on the basis of signs and symptoms as well as results of diagnostic tests. 1. Electrocardiography (ECG) usually reveals abnormalities corresponding to the underlying condition, which most frequently are features of myocardial ischemia, arrhythmia, or conduction abnormalities. 2. Chest radiographs: In addition to features of the underlying condition, they may reveal pulmonary congestion, pleural effusions, and cardiac enlargement. 3. Echocardiography reveals cardiac abnormalities, which may be functional (systolic or diastolic myocardial dysfunction, valvular dysfunction) or anatomical (eg, mechanical complications of MI). 4. Laboratory tests: The basic set of tests includes complete blood count; serum levels of creatinine, urea/blood urea nitrogen, sodium, potassium, glucose, cardiac troponin, and liver enzymes; arterial blood gas levels (in patients with mild dyspnea, pulse oximetry may be used, with the exception of patients with shock causing very low cardiac output and peripheral vasoconstriction). Natriuretic peptide levels (B-type natriuretic peptide/N-terminal pro–B-type natriuretic peptide) can be useful in differentiating between cardiogenic (higher levels) and noncardiogenic causes of dyspnea. 5. Endomyocardial biopsy: For indications, see Chronic Heart Failure. Other causes of dyspnea and edema. Consider also causes of noncardiogenic pulmonary edema (features facilitating differentiation between noncardiogenic and cardiogenic pulmonary edema: Table 1), acute respiratory failure, and (acute) interstitial lung disease. 1. Short-term treatment goals: Control of symptoms (primarily of dyspnea) and hemodynamic stabilization of the patient. 2. Treatment of the underlying condition is mandatory in every case. 3. Close monitoring of respiratory rate, heart rate, ECG, and BP. Measure these parameters regularly (eg, every 5-10 minutes) or continuously (in unstable patients) until the patient’s condition is stable and drug doses need no further adjustment. Noninvasive automated BP monitors are reliable as long as there is no severe vasoconstriction or significant tachycardia. Rhythm and ST-segment monitoring is mandatory in AHF, particularly when caused by ACS or arrhythmia. In patients treated with oxygen, monitor hemoglobin oxygen saturation in arterial blood (SaO2) using a pulse oximeter regularly (eg, every hour) or continuously (preferable approach). 1) A Swan-Ganz catheter placed in the main pulmonary artery allows measurement of pressures in the superior vena cava, right atrium, right ventricle, main pulmonary artery, as well as pulmonary capillary wedge pressure, cardiac output (see Shock), and oxygen saturation of mixed venous blood; the use is limited. 2) A central venous catheter is used to measure central venous pressure and oxygen saturation of the venous blood (SvO2) in the superior vena cava or in the right atrium. 3) A peripheral arterial catheter (usually placed in the radial artery) is used for continuous BP monitoring. 1) Worsening or decompensation of HF: Use vasodilators in combination with loop diuretics (in patients with impaired kidney function or those already receiving long-term diuretic treatment, consider using higher doses of diuretics). Use inotropic agents in patients with hypotension and features of organ hypoperfusion. 2) Pulmonary edema: Figure 1. 3) AHF with high BP: Vasodilators (close monitoring is necessary). 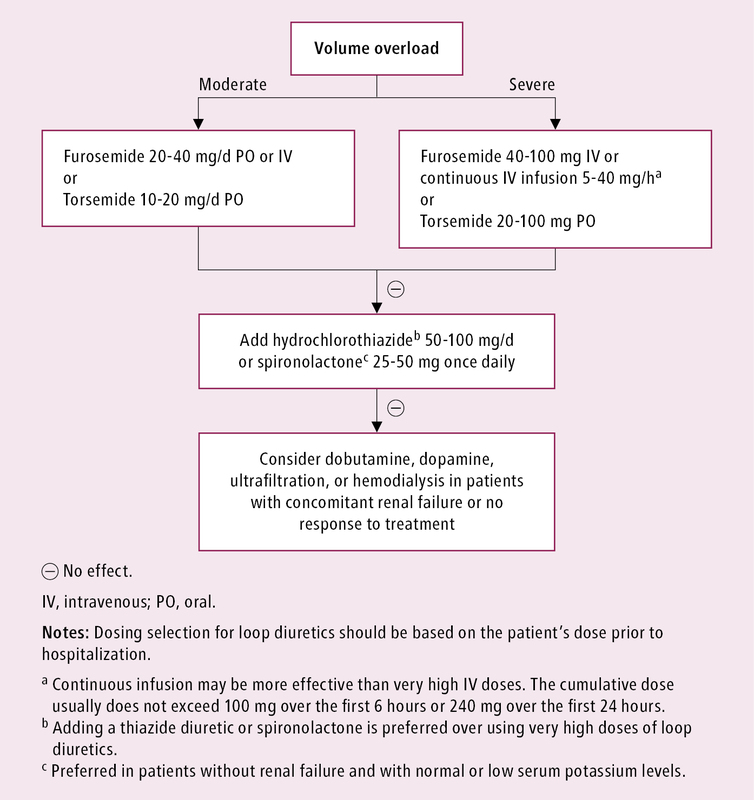 Use low-dose diuretics in patients with volume overload or pulmonary edema. 5) Isolated right ventricular AHF: Maintain right ventricular preload. If possible, avoid vasodilators (opiates, nitrates, angiotensin-converting enzyme inhibitors [ACEIs], angiotensin receptor blockers [ARBs]) and diuretics. Cautious administration of intravenous fluids may be effective (with careful hemodynamic monitoring). Low-dose dopamine is sometimes used. 6) AHF in the course of ACS: Perform echocardiography to determine the cause of AHF. In patients with ST-segment elevation MI or non–ST-segment elevation MI, perform coronary angiography and revascularization. In patients with mechanical complications of acute MI, urgent surgical treatment is necessary. 1. Vasodilators may be used in patients with features of hypoperfusion and congestion but without hypotension. They are generally avoided in patients with systolic blood pressure (SBP) <110 mm Hg. Vasodilators lower SBP, LV, and right ventricular filling pressures as well as peripheral vascular resistance while improving dyspnea. BP monitoring is mandatory. Use vasodilators with particular caution in patients with mitral or aortic stenosis. 1) Intravenous nitroglycerin: Start with 10 to 20 microg/min and increase the dose as needed by 5 to 10 microg/min every 3 to 5 minutes up to the maximal hemodynamically tolerated dose (maximum, 200 microg/min); alternatively, nitroglycerin may be administered orally or in the form of translingual spray at a dose of 400 microg every 5 to 10 minutes. Because tolerance develops after 24 to 48 hours of treatment with high-dose nitroglycerin, the drug should be used intermittently. In case of BP dropping <90 mm Hg, reduce the dose of nitroglycerin. If BP continues to fall, discontinue the infusion. 2) Intravenous sodium nitroprusside: Start with 0.3 microg/kg/min, up to a maximum dose of 5 microg/kg/min. Nitroprusside is recommended in patients with severe AHF in the course of hypertension and in patients with AHF caused by mitral insufficiency. Do not use nitroprusside in patients with AHF in the course of ACS, as it may cause a coronary steal effect. In patients receiving long-term treatment with nitroprusside, particularly patients with severe kidney or liver failure, toxicity caused by its metabolites—thiocyanate and cyanide—may occur (abdominal pain, confusion, seizures). 2. Diuretics are mainly used in patients with AHF and features of volume overload, that is, pulmonary congestion or peripheral edema. High doses of diuretics may cause a transient deterioration in kidney function. An algorithm of diuretic treatment in patients with AHF: Figure 2; agents: Table 5 in Essential Hypertension. In patients treated with diuretics, monitor urine output (catheterization may be necessary); adjust the dose of diuretics to the clinical response; restrict sodium intake; monitor serum creatinine, potassium, and sodium levels every 1 to 2 days, depending on the urine output; and correct for potassium and magnesium loss. 3. Inotropic agents may be used in patients with AHF associated with peripheral hypoperfusion and hypotension (SBP <85 mm Hg). Monitor ECG because of the risk of tachycardia, myocardial ischemia, and arrhythmia. Agents and dosage: Table 4 in Chronic Heart Failure. 4. Vasoconstrictors are considered in patients with persistent hypotension and hypoperfusion despite appropriate volume status. Agents and dosage: Table 4 in Chronic Heart Failure. 1) Amiodarone is the only antiarrhythmic agent with no negative inotropic effects that is effective in most types of supraventricular and ventricular arrhythmia. 2) In patients with HF receiving long-term treatment with beta-blockers who are hospitalized due to HF exacerbation, the beta-blockers generally should not be discontinued unless it is necessary to use inotropic agents. In patients with bradycardia or an SBP decreased to <100 mm Hg, reduce the dose of the beta-blocker. If the beta-blocker has been discontinued, resume the treatment once the patient is hemodynamically stable. 3) In patients receiving long-term ACEI/ARB treatment, these agents should not be discontinued unless it is unavoidable (eg, in a patient with shock). Caution is advised when starting ACEIs/ARBs in patients with HF in the acute setting. If ACEI/ARB are indicated and no contraindications exist, start the treatment before discharge. 5) Once the patient is stable, add an aldosterone antagonist in patients with ACS, ejection fraction ≤40%, and no contraindications. Assess kidney function and serum potassium levels before starting the treatment. 1. Ventilatory support: Consider this in patients with persistent SaO2 <90% despite maintained airway and oxygen treatment. Generally start with noninvasive support, but invasive support may also be considered if patients are tiring out due to work of breathing or severe pulmonary edema causing hypoxia. 2. Circulatory support, such as extracorporeal membrane oxygenation (ECMO), may be considered in patients with AHF resistant to pharmacologic treatment (except for those with increased cardiac output) if improvement in cardiac function is expected or as a bridging therapy before heart transplantation or another intervention that may restore cardiac function. 1) Multivessel ischemic heart disease causing severe myocardial ischemia. 2) Acute mechanical complications of MI. 3) Acute mitral or aortic regurgitation caused by endocarditis, trauma, or aortic dissection (in the case of aortic insufficiency). 4) Some complications of percutaneous coronary intervention. 1. Prosthetic valve thrombosis is often fatal. If this is suspected, perform echocardiography immediately. 1) In patients with a thrombosed prosthetic pulmonary or tricuspid valve or at high surgical risk, use fibrinolytic agents: alteplase (10 mg IV bolus followed by an IV infusion of 90 mg over 90 minutes) or streptokinase (250,000-500,000 U IV over 20 minutes followed by an IV infusion of 1-1.5 million U over 10 hours and then by unfractionated heparin treatment). 2) In patients with a thrombosed prosthetic mitral or aortic valve, the preferred treatment is valve replacement. 2. Acute kidney injury in the course of AHF leads to nonrespiratory acidosis and electrolyte disturbances that may cause arrhythmia, reduce effectiveness of treatment, and affect the prognosis. Moderate to severe renal failure (serum creatinine levels >190 micromol/L [2.5 mg/dL]) is associated with an impaired response to diuretics. In patients with persistent volume overload despite appropriate pharmacotherapy, consider continuous venous hemofiltration with ultrafiltration. 3. In the case of bronchoconstriction in a patient with AHF, administer nebulized salbutamol 0.5 mL of a 0.5% solution (2.5 mg) in 2.5 mL of 0.9% saline over 20 minutes. Administer subsequent doses every hour for the first few hours, then continue as needed. Figure 1. 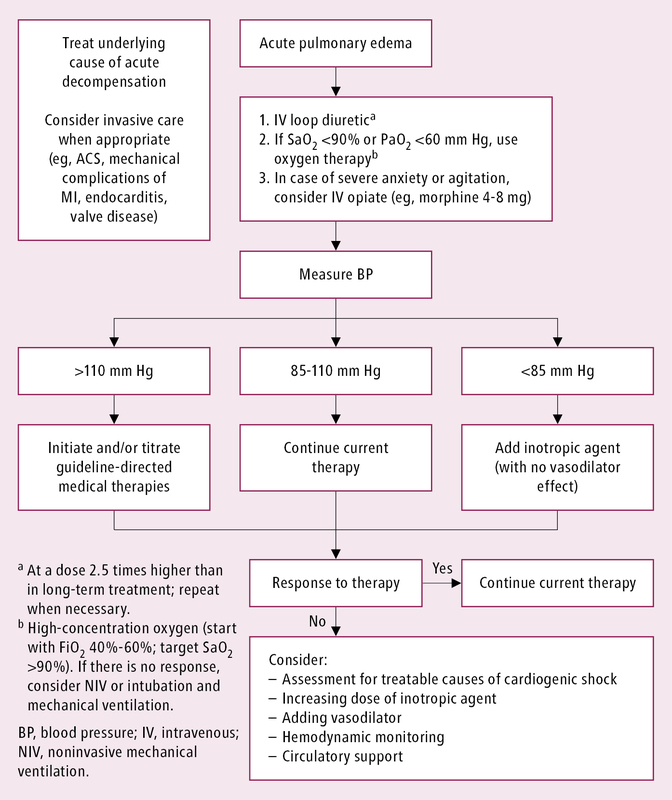 Management algorithm in patients with acute pulmonary edema. Adapted from the 2012 European Society of Cardiology guidelines (see Additional Information for details). Figure 2. Algorithm of diuretic therapy in patients with acute heart failure. Adapted from the 2008 European Society of Cardiology guidelines (see Additional Information for details).